I know what you’re thinking: This is the most evil, diabolical idea in the world! I thought the same thing. And then it struck me: I must get one in my mouth immediately, if not sooner. As a reader of this blog, you know that I’ve tried not once, but twice, to use creme eggs in recipes. Just goes to show, sometimes you have to leave it to the pros. Enter Eamonn’s Dublin Chipper. An Alexandria, Va., fish and chips place, Eamonn’s, offers this delicacy during creme egg season. They go so far as to obtain the UK Cadbury eggs, which – joy of joys! – are slightly larger than their American counterparts. They also seem not as cloyingly sweet, too, which is one factor that made the deep-fried creme egg experience so enjoyable. The egg is covered in cinnamon and sugar and collapses as the knife slices through the once-firm outer skin. Oozing from the center is the sweet goo that sets a Cadbury Creme Egg apart from all other confections. As the outer sugary coating crunches between your teeth and the goo slides down your tongue- Oh, is it getting hot in here or is it just me? I’ll stop the story here; this is an event you must experience for yourself. 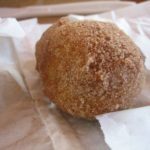 I would be remiss if I did not express my gratitude to one Mr. Steve Buttry for sharing his deep-fried creme egg experience via Twitter. The world is a better place now that I’ve enjoyed this over-the-top dessert. Of course, I’m also about $4 poorer thanks to the dessert, too. 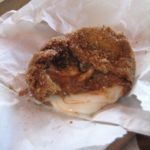 But if you’re going to splurge both economically and calorically, the Deep-Fried UK Cadbury Creme Egg is a must-try for all creme egg junkies. Have you tasted this diabolical confection? Ever eaten a dessert even more evil than this one? We Southerners will deep fry anything. These sounds like heaven! Deep fried mars bar. So wrong, but so good! 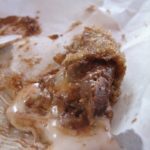 everyfoodfits.com » Cadbury Creme Egg Experiment – Round 3 – SUCCESS!